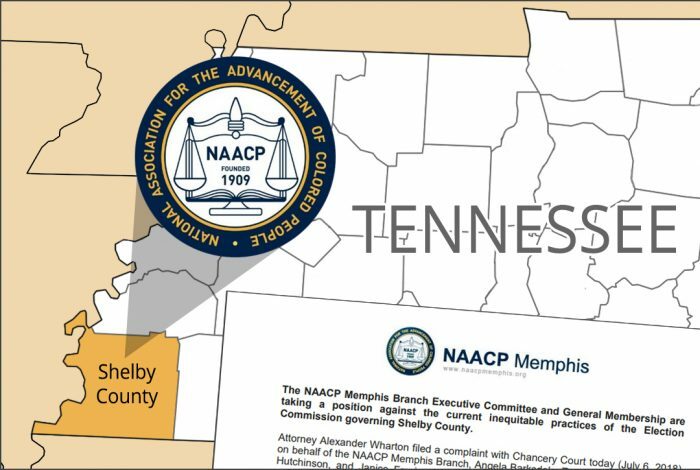 Photo credit: Adapted by WhoWhatWhy from FEMA (PDF), NAACP Memphis, and NAACP Memphis (PDF). Election officials in Shelby County, Tennessee, will soon find out if the excuse of being overwhelmed holds up in court. They’ll almost certainly make that argument in response to a new lawsuit from the NAACP. Filed Wednesday, it accuses the local election commission of mismanaging thousands of eleventh-hour voter registration applications. Here’s the background: The Shelby County Election Commission — which administers elections in Memphis and surrounding suburbs — received thousands of voter registration applications just before the deadline last week, an unprecedented last-minute surge. Many of these ballots contained deficiencies, including misspelled names, missing social security numbers, and incomplete addresses, the commission said. But the NAACP suit charges that election officials have failed to provide an opportunity for those voters to correct the errors and cast a ballot. There are two issues. First, under state law, election officials must let the voter know when they reject a registration. They also are legally bound to allow voters to correct any errors or oversights in their registrations at polling places — or to “cure” their registrations. Often, that means updating registrations when they vote or calling the Election Commission before casting a ballot. Shelby County officials provided the resources to “cure” registration problems when early voting started last week — though the process was fraught with technical problems. But the Election Commission hasn’t promised to offer the same resources on Election Day. Instead, officials propose that voters with deficient registrations cast a provisional ballot. This move could, in effect, jeopardize the ballots of African American voters who submitted registrations on time, according to the NAACP. In part, that’s because election officials can still reject provisional ballots. Some worry that the difficulty in processing registrations will only spill over to the provisional ballot process. The commission told WhoWhatWhy last week that some 45 percent of the last-minute applications had deficiencies. Many lacked basic contact information such as last names and phone numbers, according to the Commission. The plaintiffs in the case want the Election Commission to notify all those who submitted applications before the deadline of their status — and share a list of all the rejected applications. Moreover, they seek a commitment to provide the same opportunity to “cure” deficient applications on Election Day. The Tennessee Black Voter Project submitted many of the rejected registrations. The advocacy group carried out a statewide registration campaign to reach black voters in the state. Along with a handful of individuals affected by the Election Commission’s decisions, the organization is a plaintiff in the case.